“WhiteGold was looking for a market-leading mobility vendor with a full suite of solutions far beyond that of simple MDM – we wanted a vendor that offered a full enterprise mobility management platform, with containerisation as a key technology therein,” WhiteGold Solutions MD, Dominic Whitehand, said. It has been confirmed to ARN that Good Technology’s former vendor, Express Data, will not be renewing its contract. WhiteGold intends to use Good Technology to launch its new Mobility Practice, with which the company wants to build a enterprise mobility management platform and eco-system for its 2000 resellers. Whitehand said he expects MDM to be a key part of the company’s value added distribution business strategy. With the deal, WhiteGold will market Good Technology’s key products, such as Good Collaboration Suite, and its Good for Enterprise applications. The latter securely manages data and devices, including secure email, calendar, contacts, browser access, task management and document data. The distie will target the legal, healthcare and government sectors. WhiteGold’s partners will received training pre- and post-sales and technical support, alongside lead generation and the streamlining of processes such as renewals automation and partner enablement. Good Technology’s APAC director of channel sales, David Cockerham, said the new deal will bring significant opportunities for both businesses. “WhiteGold not only provides invaluable experience of operation across the Australian channel landscape, the company is also quickly gaining a solid understand of our value propositions around secure mobility and containerisation,” he said. “Together we look forward to offering the most comprehensive enterprise mobility management ecosystem available for the Australian Channel." The deal is a good win for WhiteGold, and Whitehand told ARN that the distie is also looking at another year of growth as EOFY closes in. Company growth will be ‘far and away high than the industry standard’ at around 40-50 per cent. He wants WhiteGold to grow to ‘be close to 50 people by Christmas 2014’. Whitehand attributes this to strong performance from the company’s security (40 per cent plus growth, he estimates), Cloud networking and datacentre divisions, and expects the aforementioned mobility practice to drive further growth. The company is also looking at launching and SDN practice as well, which he believes will be the next hot market segment. 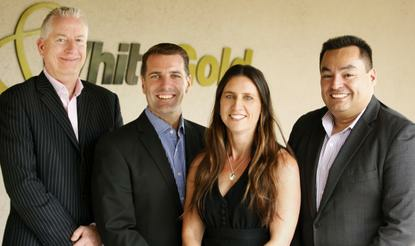 A key big win was WhiteGold neing named APAC Distributor of the Year 2014by vendor Barracuda. This was on the back of 60 per cent year-on-year revenue growth.